Publisher/Date: Alfred A. Knopf, an imprint of Random House Children’s Books, a division of Random House, Inc., c2013. Max considered this. “Which vessels sail at noon?” he asked. Max’s parents are owners and actors in a renowned theatrical company that has just been invited by the Maharajah of Kashmir in India to establish a theater company for him. But when Max arrives at the designated dock to take the trip with his parents, there is no boat and no parents. Returning to his home, he alerts his Grandmother of the problem and the worrying begins. What is Max going to do for income to take care of himself? Max starts using his acting and observation skills and markets himself around the neighborhood as a problem solver, being hired to find a missing dog, a lost spoon, among other things. But the question he really wants to answer is where are his parents? Are they safe? Max’s grandmother is the voice of reason among the excitement of the invitation to India, but of course no one listens until it’s too late because their egos are so inflated that dissenting opinions can’t reach their ears. The mysteries are lightly intertwined, and the clues are all there for listeners to discover the answers before being revealed by Max in flourishes that mimic his father’s theatrical style. Max’s independent thinking and unique problem solving skills make me think of an earlier Encyclopedia Brown or a younger Sherlock Holmes. His ideas are complemented by a young girl named Pia’s insistence at being his assistant, a much more loquacious version of Holmes’ friend Watson. Max ascertains “whatever she might claim for herself, her real talent was for asking questions. The girl was always asking questions, and some of them were just what Max needed to hear in order to discover his own ideas.” (259) We’ll have to keep asking more questions as this story continues. Paul Boehmer’s booming voice serves Cynthia Voigt’s descriptive text well, setting the vivid scenes for listeners. His fully voiced narration distinguishes between Max, each of his parents, his grandmother, and the colorful cast of characters that Max interacts with as he searches for his parents and the things he is hired to find. But like so many of the audiobooks I’ve recommended recently, if you pick the audiobook you’ll miss out on the illustrations by Iacopo Bruno. 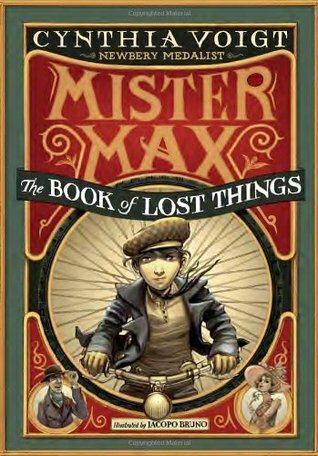 I’ll be recommending this series whole heartedly, and the second book in the trilogy, Mister Max: The Book of Secrets, will be released in September 2014. The Young Adult Library Association announced their nominations for the Teens’ Top Ten Award. Teens’ Top Ten is a “teen choice” list, where teens nominate and choose their favorite books of the previous year. Readers ages twelve to eighteen can vote online in August and September, and the winners will be announced during Teen Read Week in October. I love how YALSA runs their Teens’ Top Ten Award, because not only are the nominations determined by teens (who get to read ARCs in order to stay ahead of the publishing schedule) but it also allows the general public several months to get ahold of the books to read prior to making their decision. While the website has some really great publicity, they don’t have an easy to distribute summary of the titles to give to teens. Taking the four page PDF printout, I condensed the descriptions even further to just a few lines, included the title, author, and book cover, and will be printing them out in a tri-fold for my teens. I’ve included a copy for others to use if you’d like. If someone can tell me how to add a Publisher file to the blog, I’ll add it in that format, but for right now, it’s available as a PDF or as an admittedly rough copy of a Word .doc file and you can paste your logo and contact information where it’s indicated. If anyone has an issue with what I did, just let me know and I’ll remove it. A computer program written by Mr. Pugh automatically plays the highest-rated rendition of each scene, and it compiles those scenes on the fly, so the movie can change in real time depending on the ratings of users. I haven’t watched the whole thing yet, but what I have watched is amazing, and any Star Wars fan should take a look. Apparently it’s even supported by Lucas Films! I feel like this is totally something you should have found in Ready Player One. 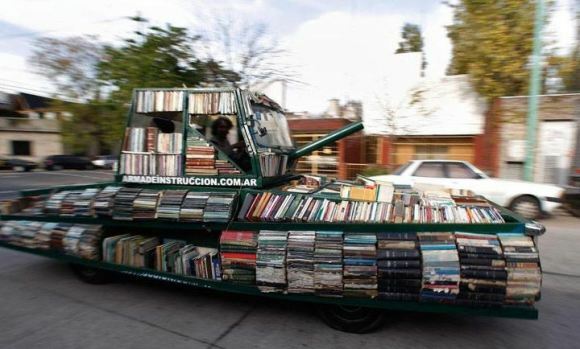 Last, but certainly not least for this Sunday Shout Out, is the Weapon of Mass Instruction. I don’t speak/read Spanish well enough to glean any information from the original site, but the blog I’ve linked to provides a basic translation as well as a link to a YouTube interview with the creator, Raul Lemesoff. Honestly, a picture is worth a thousand words, right? You can’t tell me this isn’t seriously cool… I’m extremely jealous. I haven’t done a Sunday Shout Out series in quite some time, so I thought I’d revive this series of posts. Sunday Shout Out was created to remind/encourage me to provide links to news stories, blog posts, and other things that I think are interesting and noteworthy. If you’re interested in participating or being featured in my next Sunday Shout Out, just drop me an e-mail. Do you have some news or links to share? Feel free to link to your own Sunday Shout Outs in the comments. Librarians, have you seen this Pearle Vision commercial? It shows a young woman with glasses with her hair up, presumably in a bun, looking straight at the screen. She starts a monologue about how someone’s library books are overdue, and they owe $97 in fines. “What,” she goes on to say, “You don’t have $97.” At this point she pulls out her hair and flings it around her face “Well, what are we going to do about that?” The screen then zooms out and we see she’s actually shopping for glasses, with two salespeople on either side looking at her reflection in the mirror with her with their jaws dropping. So I guess my poll for this Sunday Shout Out is: funny, or not? Edit: I tried several times to get the poll feature to work, but it apparently doesn’t want to, so you’ll just have to leave your opinion in the comments. Since I can’t draw, a coworker of mine drew for me giant dalmatian dogs Pongo and Perdy from Disney’s 101 Dalmatians. They served as “book ends” for a giant display case. 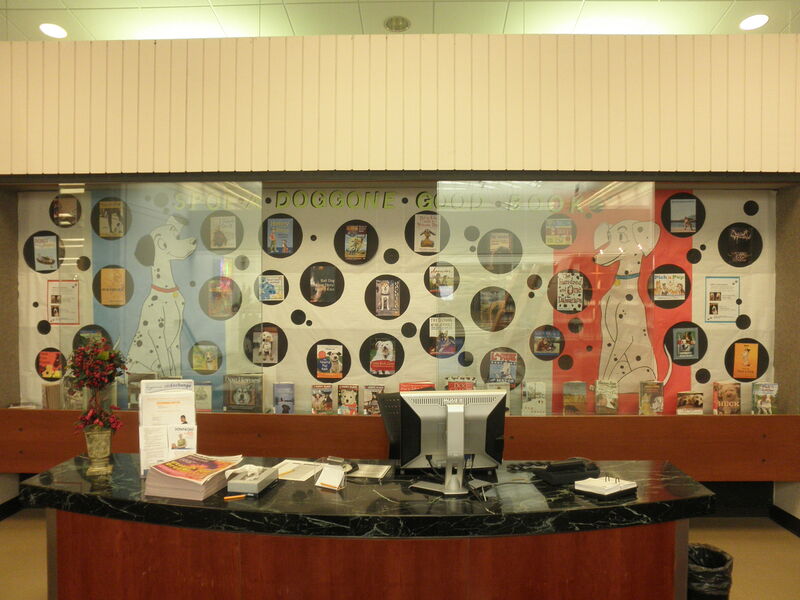 We lined the case with white paper (the kind that comes in giant rolls) and then put colored paper behind the dalmatian cut-outs so they stood out from the white. We traced a pot lid onto black paper (the 11×17 size) and cut out black dots to scatter throughout the display. We also added some more black dots in smaller sizes, to provide dimension and contrast and just visual interest. Because the shelves for the display case are hard to install with a background paper, and because we only have so many shelves, we printed out color copies of books about dogs and stapled them up in the display case. The finished product looks amazing and I have to thank my coworker for completing the installation of it since we ran out of time and I was at a training meeting all the next day. Some of you might be able to identify the library by the display space, but I’m so proud of these that I love being able to share them with other people. There are sliding glass panels that somewhat obstruct the picture, but you get the general idea. Due to the overabundance of dog books out there, I don’t think I really need to make a list. We were hard pressed to limit the number, as just off the top of my head I can think of Marley, Tintin’s Snowy, Clifford, Spot, Houndsley, Lassie, Ribsy, Dan and Ann in Where the Red Fern Grows, Call of the Wild, and Old Yeller. At one of the libraries I work at, I share responsibility for changing out the display spaces, a task that I absolutely LOVE. Even though I’m not artistic in the least bit, I have a lot of opportunities to do a play on words or puns and utilize my computer skills. Oh, Clip Art and Google Images, how I love thee, let me count the ways. Sometimes though, it’s as easy as copy and paste. 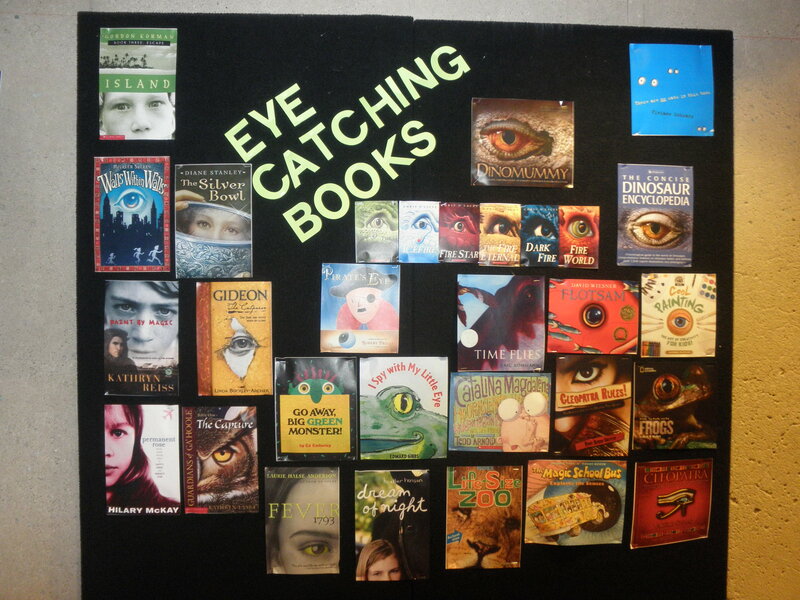 For instance, my latest and greatest creation: Eye Catching Books! Last Dragon Chronicles series by Chris D’Lacey (Fire Within, IceFire, Fire Star, The Fire Eternal, Dark Fire, and Fire World) I couldn’t just choose one, since they are all so unique and different and beautiful. I had one of the pages help me with this one. For about a month, any time she ran across a cover with an eye on it, she’d show it to me before shelving it so I could record the title and author. Then, when I had a good list, I copied the cover art from our online catalog and pasted them into a Publisher document, enlarging it so each cover had its own page (except for the dragon series, which I made smaller in order to include them all). I printed them on the color printer and trimmed the edges. The letters were made from our die-cuts (wonderful device, die-cuts), but you could always create your own bubble letters to fit the size you need. There were a few other titles that we found, but I ran out of room so I picked the ones that enlarged and printed the clearest. Personally, I think this was one of my most sucessful displays, as quite a few people asked for books from the bulletin board and even more stopped to look and admire the collection of titles. I’ll be featuring more of my bulletin board displays from now on. For now, are you responsible for the display space in your library, and what has been your favorite bulletin board display? Publisher/Date: Listening Library, an imprint of the Random House Audio Publishing Group, c2003. Meggie has led a quiet life with her bookbinder father Mo, surrounded by books and reveling in the enjoyment they provide her. One late night however, a mysterious man called Dustfinger visits their farmhouse, calling Mo “Silvertongue” and insisting that Mo is in danger. 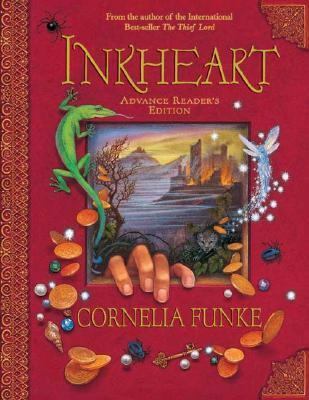 Meggie and Mo flee to her mother’s aunt Elinor’s house, but danger follows them in the form of Capricorn, a deadly man who arrived quite by accident from the pages of the book Inkheart years ago. Capricorn is convinced that Mo can help him release the rest of his crew from the story to wreak havoc against the real world he now finds himself. Meggie must enlist the help of her book obsessed aunt, a young boy, and Dustfinger, who has questionable motives of his own for recovering the book, in order to rescue her father and set to rights the mistake that was made years ago. The adventure is palatable but some events might prove a little scary for some younger audiences. Basta, Capricorn’s right hand man, wields a knife with deadly accuracy and quite often is found putting it up against someone’s neck or face. As they say in the books at one point, it makes for delicious reading but a very deadly real life situation. But the cruelty is in context and reinforces Basta’s and Capricorn’s characters and also Meggie’s fears towards the villans. And believe me, the villans are NASTY. “How many books do you have?” asked Meggie. She had grown up among piles of books, but even she couldn’t imagine there were books behind all the windows of this huge house. Author: Warren Davis Graham, Jr.
Publisher/Date: Pure Heart Press, c2006. *Horrible cover photo, I know, but I couldn’t find anything bigger or clearer. “The whole idea, and my fervent wish in producing this text, is to empower you to be able to respond to a situation rather than simply react. Animals react, people should respond. However, since we humans are creatures of emotion and not logic, we often do something and then think about it rather than the opposite. I’m going to show you a way to put a plan of action in place, then you can take the first step in controlling your environment. Warren Graham is also known as the Black Belt Librarian, a little erroneously in my opinion because as far as I can tell he’s never possessed an MLIS or worked as a librarian. He is however a security expert, and worked as such in a library setting for over twenty years. Is quite obvious that he knows what he’s talking about, and his book and presentations come highly recommended by everyone I’ve questioned, although it seems like everyone booked a presentation by him at the same time. Graham has a no-nonsense, straightforward writing style. Rather than fill this wonderfully brief book — it’s so short you can read it on your lunch hour — with platitudes like quite a few management books, Graham provides real-world examples of what you can do, starting tomorrow, to improve your interactions with patrons and make your library safer. He also describes four emotional states that patrons might exhibit; anxiety, belligerence, out of control, and calm. Graham states that “I could try and impress you with fancier terms or a longer list, but there is no need, it’s not my style and I am here to help you in the real world.” That’s how his entire book is, and in this chapter specifically he gives some real world examples of phrases and actions you can use immediately. I know at my library, we’ve really put an effort recently into implementing his ideas in chapter four about saying “No”, because we’ve had some backlash with that word from patrons. One saying in particular that really seems to defuse the situation is his suggestion to preface corrections with “I know you didn’t know, but . . .” or “I know there isn’t a (or you didn’t see the) sign, but . . .”, and people seem to be responding to that. And he’s right when he tells readers to “Be prepared to be accused of some type of prejudice.” (26) It just comes with the territory and job description. Another chapter that is probably invaluable for libraries is chapter six, titled “Ten Day-to-Day Staples of Security”. I think these are a must have inclusion in any library policy. While some of them will probably be met with some initial grumbling (for instance: “Staff areas should be locked at all times”) it would improve safety for everyone who works there. Personally, my initial reaction was to sigh softly in frustration at the thought of unlocking and re-locking the staff doors every time I race back there for something. Plus, it would substantially increase the number of keys that need to be handed out and kept track of, but I can understand and appreciate his reasoning from a security standpoint. The final thing that Graham provides libraries is a simple security log. I like his log idea so much better than a computer database, which requires some training and knowledge and training in order to consult and edit. Using a computerized Excel or other spreadsheet, it would make it easy to sort and search by date, name, department, or other information. It’s stressed in the book to maintain records of your security logs, and I couldn’t agree more. Everyone I’ve talked to has encouraged me to see Warren Graham’s presentation. In lieu of this opportunity, I encourage librarians to read his book. He keeps his vignettes to a minimum, which is also refreshing because you don’t have to weed through the stories to get the facts. His no-nonsense style tells you what you need to know and how to use it, without over analysis of the psychology of patrons or their reasons or motives. Because, in reality, do we really care why they’re acting the way they are, so long as they leave the library before they cause any serious damage?